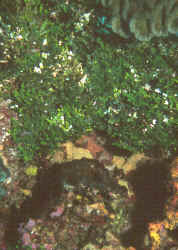 Halimeda ... a good type of algae to grow to out-compete noisome species. I am considering the purchase of a 180 gallon acrylic tank with an internal refugium (dark partition between refugium and display portion of the tank). My plan is for a fish only with refugium (FOWR). I would like to light the refugium horizontally through the acrylic (which if I am correctly reading the response to Light Panels, canopy... design 4/26/08 would be possible). I read (http://www.sdplastics.com/acryliteliterature/1213FUVtransTB.pdf ) where clear acrylic (ACRYLITE specifically) 1 inch thick only attenuates 0.5% of visible light. Is this true of acrylic typically used to construct fish tanks? Also, to ensure minimal nuisance algae growth should I have more light in the refugium than I do in the display portion of the system? When I had a reef tank I had algae issues I couldn't resolve and I think in large part it may have been because there was 5 times as much light in the display tank than there was in the sump/refugium. I think that if I had decreased the lighting in the display tank and increased the lighting in the sump I may have been able to eventually over come the algae problem. and 1 bank of 60W (6ft long) for the display. Does this seem like a good starting point? Really enjoy your site and have learned a lot! I have a serious problem with microalgae growth. I've read many of your suggestions and decide to grow some macroalgae to compete with the micro for nutrients. The problem is that the micro begins to cover the macro. 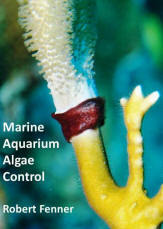 I try to wipe or blow the microalgae off with water currents, but I think it causes too much stress on the macroalgae. The first batch of macroalgae died, and I just purchased some more. I was wondering if you had another suggestion on stopping the micro from smothering the macro. Also, do you think I should reduce the hours of light to help fight the micro or will this ultimately hurt the macro more. P.S. I could maybe send pics if that would help, although I'm not great with technology. Question: I have a green algae that is growing on the glass of my 85 gallon Hex tank. It is 3 years old, has a sump filter system with a skimmer inside. I have a 175 watt 5500K Metal halide with reflector installed along with an attinic blue flourescent bulb. I have been using some calcium blocks from a local reseller and I cam not experiencing any coralline algae growth anywhere. I have 2 tangs (Chervron and Yellow) a Sleeper goby a niger trigger a neon damsel and a rock beauty angel. They are doing great.